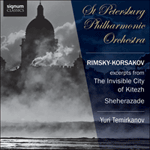 By the time Rimsky-Korsakov came to compose his symphonic suite, Scheherazade, Op 35 in the winter of 1878–88, he had been co-opted into the circle of Mitrofan Belyayev, the son of a wealthy timber merchant who, after achieving great success in his father’s firm, turned his mind and money to his main desire—music, and the future of Russian music in particular. Belyayev’s contribution to the music of his homeland is an extraordinary labour of love, resolute industry and high-end production. In 1884, he instituted the Glinka Prize, awarded annually to a Russian composer, following this up in 1885 with the Russian Symphony Concerts series and, more important still, he was granted permission to establish his own publishing house in Leipzig, thus securing a form of international copyright for Russian composers. Registered as M.P. Belaieff, the company would publish scores of the most important Russian compositions, from Glinka through ‘The Mighty Handful’ to Scriabin and beyond, in luxurious editions. The house continued to do so after Belyayev’s death until the Soviets appropriated it after the revolution. This vital catalogue passed over to Edition Peters of Leipzig in 1971. Rimsky-Korsakov’s three most popular orchestral compositions were early and most worthy beneficiaries of Belyayev’s publishing largesse: the so-called ‘Russian Easter Festival’ Overture, Capriccio espagnol and, the most widely known of all his works, Scheherazade. Scheherazade is suffused in orientalism, as Rimsky-Korsakov perceived it, and not only the Russian variety. The composer’s experience of travelling great distances by sea in a navy of the 19th century undoubtedly informed the exotic nature of much of his music. The model for Scheherazade is certainly far flung, emanating from orally transmitted stories from the folklore of the Middle East, Asia and North Africa over many centuries, and eventually notated by Arabic scholars in numerous collections of varying sizes. Known in English as ‘One Thousand and One Nights’ or ‘Arabian Nights’, the stories all emerge from a single over-riding construct whereupon a Persian potentate, Sultan Shahryar, discovers that his brother’s wife, and then his own spouse, have been unfaithful. In his horror and grief, the Sultan assumes that all wives will be the same and so vows to marry a succession of virgins who will be executed the morning after nuptial rites are fulfilled. Soon the Sultan’s Grand Vizier runs out of virgins and is aghast, but accepting, when his daughter offers her services. Scheherazade avoids the morning beheading by telling the Sultan a tale, but not finishing it. And in the succeeding nights she continues in a similar manner, either not ending, or only just beginning a fascinating, kaleidoscope of tales which range over a bewildering array of topics, from myth and medicine to adventure and erotica. The common factor, as in all effective serial drama, is that the Sultan retires to bed wanting more. And Scheherazade keeps her head. Rimsky-Korsakov’s response to this extraordinary creation is to produce his own kaleidoscope of grand invention and swirling, ecstatic storytelling. Originally entitling the four movements Prelude, Ballade, Adagio and Finale, the composer was persuaded to add descriptive titles, but withdrew them because for him the piece was essentially a symphonic work which evoked oriental and fairytale images and character. Writing in his marvellous autobiography, ‘My Musical Life’, he maintains that these titles were to ‘direct but slightly the hearer’s fancy on the path along which my own fancy has travelled’. Despite this, the movements have inherited titles: ‘The sea and Sinbad’s ship’; ‘The legend of the Kalendar Prince’; ‘The young Prince and the young Princess’; and ‘Festival at Baghdad’. It seems clear from the work that the stark, strong opening motif represents the angry, sorrowful Sultan, while Scheherazade’s thread is the beautiful, sinuous solo violin telling its tales with fervour and abandon. Both ‘characters’ are evident, in one form or another throughout the work, until the high violin at the finale seems to calm the Sultan’s anger as his ire sinks beneath her eloquence and charm. Setting out in his youth to promote the advancement of a purely Russian musical art, Rimsky-Korsakov’s devotion to constant learning, and the clarity instilled through revising, editing and arranging both his own musical thoughts, as well as those of other composers, ensured that his influence extended far beyond his homeland, spreading forward into the European avant-garde of the following generation—to Debussy, Ravel, Stravinsky and beyond.